The tradition of the split bamboo fly rod goes back over 150 years. During this time, a number of rod makers have achieved legendary status for crafting outstanding fly rods. Many of these makers — including E.W. Edwards, Fred Divine, and Wes Jordan — were iconoclasts who bucked the trends of the day to break new and exciting ground. This tradition of pushing the limits of split bamboo is alive and well, and this book seeks to celebrate these contemporary makers and their craft. 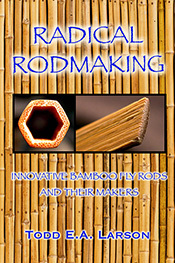 The profiles of the radical rods and the men who make them were based on a series of interviews conducted over a period of nearly four years, and the end product is a refreshing look at the exciting world of extreme bamboo fly rods. Just some of the makers interviewed for this book include Marc Aroner, Tim Abbott, Wayne Maca, Jeff Hatton, Tom Smithwick, Glenn Brackett, A.J. Thramer, Rob Smith, Kurt Zumbrunn, Joe Arguello, and Bob Clay (whose beautiful two handed bamboo spey rod with splice joints is pictured above). If you want a look at where the bamboo fly rod is today, and where it is going tomorrow, this book is for you. If you want to understand the reasoning behind why men and women split cane for a reason, then you won’t want to miss it. 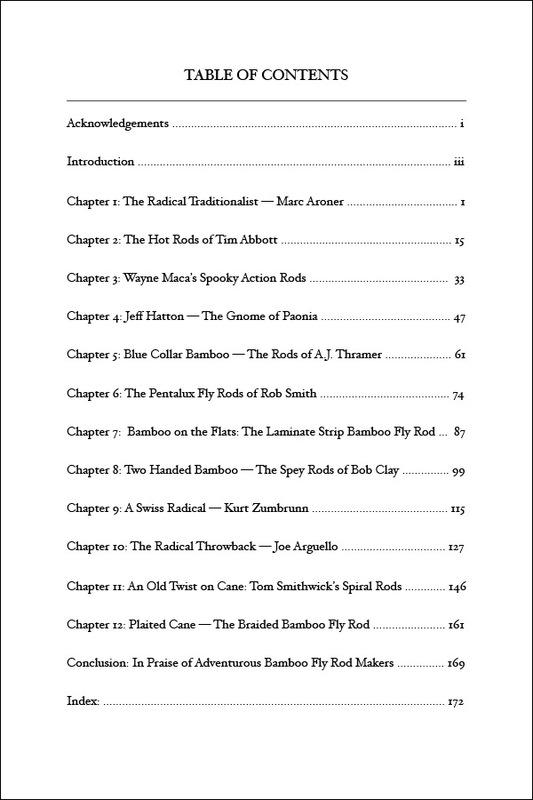 And if you want to be inspired by people unafraid to try new things, Radical Rodmaking is the book for you.